« Homepage / Other Drugs / "Mebeverine"
Im Folgenden erfahren Sie mehr zu den Anwendungsgebieten und der Wirkungsweise von Mebeverin. Lesen Sie dazu auch die Informationen zur Wirkstoffgruppe Spasmolytika, zu welcher der Wirkstoff Mebeverin gehört. Der Wirkstoff wird bei Magen-Darm-Beschwerden (Reizdarmsyndrom) eingesetzt, die mit Durchfall, Blähungen oder Verstopfung einhergehen. 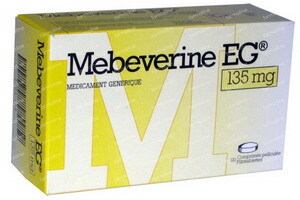 Mebeverine belongs to the Group of anticonvulsants and the subgroup of the muskulotropen anticonvulsants. The active ingredient is directly relaxing in the muscle cells in the gastro intestinal tract. If digestive complaints such as diarrhea, bloating, and constipation caused (so-called functional indigestion or irritable bowel syndrome) exclusively by this muscle tension and have no other cause, they can be corrected through the use of Mebeverine or relieved. The drug is recommended for children and young people under 18 years of age. Remedy ingredients sometimes trigger allergic reactions. Should you perceive signs of an allergic reaction, so you tell your doctor or pharmacist promptly. It is important to note that the interactions can be different depending on the pharmaceutical form of a drug (for example, Tablet, syringe, ointment). The effect can be affected by Mebeverine, if at the same time Magnesiumtrisilikat to be applied to containing drug. The following information about contra-indications for the purposes of Mebeverine in General, pregnancy & lactation, and children. It is important to note that the contra-indications can be different depending on the pharmaceutical form of a drug (for example, Tablet, syringe, ointment). The active ingredient may not be in severe hepatic and intestinal obstruction (paralytischem ileus). What must you consider when pregnancy and breast-feeding? The active ingredient may be used during pregnancy and breastfeeding only under careful medical risk benefit, because there are no studies about its safety. What is taken into account in children? For use with children and young people under the age of 18, Mebeverine is not recommended due to fewer studies on efficacy and safety. What side effects can Mebeverine have? Below, you will learn the most important thing possible, well-known side effects of Mebeverine. These side effects should not occur, but can. Because everyone reacts differently to medications. Please also note that the side effects in type and frequency can vary depending on the pharmaceutical form of a drug (for example, Tablet, syringe, ointment). Very rare side effects: dizziness, drowsiness, confusion, tremors, involuntary muscle tension (dyskinesia), headaches, fatigue, insomnia, drowsiness, loss of appetite, nausea, heartburn, constipation, anxiety disorders, allergic reactions such as itching, redness, water storage in the skin.